I've been using the Lenovo ThinkCentre m90 for my business needs. It's an all-in-one touchscreen desktop with a huge 23 inch screen. That's a breath of fresh air from my 13 inch macbook air screen. 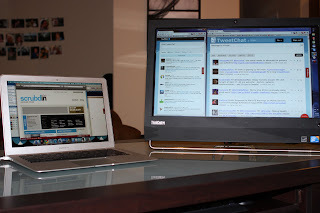 I use my Macbook Air to add medical apps to ScrubdIn and my Lenovo ThinkCentre to eye conversation in healthcare and social media on twitter. The ThinkCentre's touchscreen makes it easy to switch between Windows, refresh for new tweets, and control simple settings such as volume or launch new applications. I love how large the screen is. It's perfect for keeping tabs on what people are saying in the #HCSM chatroom. TweetChat has a rolling refresh feature so I can glance over and see any new tweets as they occur. The ThinkCentre also has an integrated 2 megapixel webcam at the top of the console. That combined with it's top-notch speakers makes for a powerful video-conferencing system. The other day, I used it to connect with Nat Findlay via Skype to learn about Hello Health. I'll be sharing my experiences with the Lenovo ThinkCentre as I integrate it into my daily life. For a video I created about Lenovo's key features, click here. Dr. Thuc Huynh is CEO of ScrubdIN, a startup company that aims to help health professionals and patients choose their next medical app. Her main interest lies around how medicine can play a role with web 2.0 and social media. Dr. Huynh is currently Chief Resident at her Family Medicine Residency in Rapid City, SD and received her B.S. and M.D. at the Medical University of the Americas.